Measurement is an integral part of science as well as of engineering, commerce and daily life. Measurement may be considered a hallmark of the scientific enterprise and a privileged source of knowledge relative to qualitative modes of inquiry. Measurement is an activity that involves interaction with concrete systems with the aim of representing aspects of these systems in abstract terms. The systems considered in this session are the historical scientific instruments tools, developed for scientific purposes in the past, for mechanical measurements, electric and electrotecnical measurements, mathematical tools, mechanical calculators, telescopes and astronomical instruments. These artefacts are important witnesses of the human culture as well as of the partnership between science and craft. As a matter of facts, in some cases, the investigators have been their own craftsmen, or, maybe, they have formed alliances with instrument makers. The focus of the session will be on the different categories of the historical scientific instruments, on the kind of measurements obtained and on the problems of preservation. Emma Angelini, graduated in Chemistry at Torino University, is Full Professor of Applied Physical Chemistry in the Faculty of Engineering, Politecnico di Torino. She is Vice-President of the ICC - International Corrosion Council. Her research areas are: Cultural Heritage protection and conservation, degradation processes of ancient metals, monitoring of museum environments by smart button sensors, innovative coatings for the protection of metallic artefacts; Plasma chemistry - PECVD techniques for surface modificiations; corrosion and protection of metallic materials; biomaterials, on dental materials in environments simulating the oral cavity, for the evaluation of the corrosion resistance and ion release. She cooperates with the Museo Galileo of Florence for the didactic activity and with the Museo della Lana di Stia (Arezzo) as member of the scientific committee. She is member of :, EFC - European Federation of Corrosion, W.P. “Surface Science: Corrosion Mechanisms” , AIM - Italian Association of Metallurgy, SCI - Italian Chemical Society, AIAr – Associazione Italiana Archeometria. 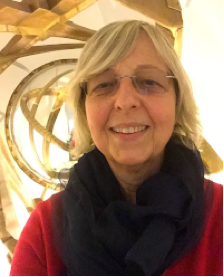 Margherita Bongiovanni is an architect and has been operating since 1998 within the Museum and Historical Documentation Centre of Turin Polytechnic. Since 2013, she has been responsible for the Polytechnic Museum that has become part of the University Library. Her activities range from projects to preserve, conserve and promote the Polytechnic historical heritage to the spread of scientific cultural programs. Her interests also involve gender studies with a focus on women who studied at Turin Polytechnic. She is the Vice-president of A.I.D.I.A., Italian Association of Women Engineers and Architects.